Newly elected legislators, Representative James Leewright and Representative Kevin Wallace, spent several hours Wednesday, December 10, becoming acquainted with the CareerTech programs in their district by visiting the Central Tech campus. The visit focused on how Central Tech creates jobs, improves education, and drives economic development in Oklahoma. “I am extremely pleased to see such a high level of interest from our newly elected legislators about the education needs of our community. I am confident they will make tremendous advocates for career and technical education. We are so appreciative of their time and look forward to working with them to strengthen education in Oklahoma,” Central Tech Superintendent Phil Waul said. Instructors from surgical technology and cosmetology shared their student pass rate of 100% on industry licensing and certifications. Graduates from both of these programs, along with many other classes, are required to pass industry certifications or licensing exams before becoming qualified for work. Certifications protect the integrity of certain job titles and represent occupational competency as required by industry. During the visit, Representatives Leewright and Wallace had the opportunity to hear firsthand from oil and gas advisory committee members as they discussed the shortage of skilled workers. They learned how the businesses are collaborating with Central Tech to help close the skills gap by delivering customized training to employees. The skills shortage is widespread, and the oil and gas industry is not alone. In the transportation industry, Central Tech works diligently to minimize the need for truck drivers by offering a 23-day truck driver training (TDT) course which currently denotes a 96% placement rate with average annual salaries of $45,000. Representatives Leewright and Wallace, joined by Representative Lee Denney heard from CareerTech’s Interim State Director Marcie Mack and learned why Oklahoma’s CareerTech system is often used as a model for programs across the United States. The system offers its programs and services throughout nearly 400 public school districts, 29 technology centers with 59 campus sites, and 16 skills centers located in correctional facilities. Each technology center works closely with advisers from local industry to ensure that students learn the skills needed to be valued members of the workforce. The Oklahoma Commerce Department projects that by 2025, Oklahoma will need 125,500 workers to fill jobs in industries that include transportation and distribution, energy and aerospace and defense. The majority of these workers will need certificates, credentials or associate degrees to fill these positions. In order to meet these needs, the Oklahoma Department of Career and Technology Education is seeking to expand its efforts to train highly skilled workers by asking the state Legislature for $36 million in additional funding for fiscal year 2016. “The CareerTech system as a whole has a robust agenda next legislative session seeking resources to fund critically needed education programs. With additional investments from the state of Oklahoma, we can expand access to educational programs that provide quality careers to Oklahomans and skilled workers to businesses,” Waul said. For more information on Central Tech or the Central Tech Impact visit CentralTech.Edu. Representative James Leewright serves part of Creek County including: Mannford, Olive, Kellyville, Bristow, part of Sapulpa and Drumright. Representative Kevin Wallace serves part of Lincoln County including: Davenport, Stroud, and the edge of Cushing. 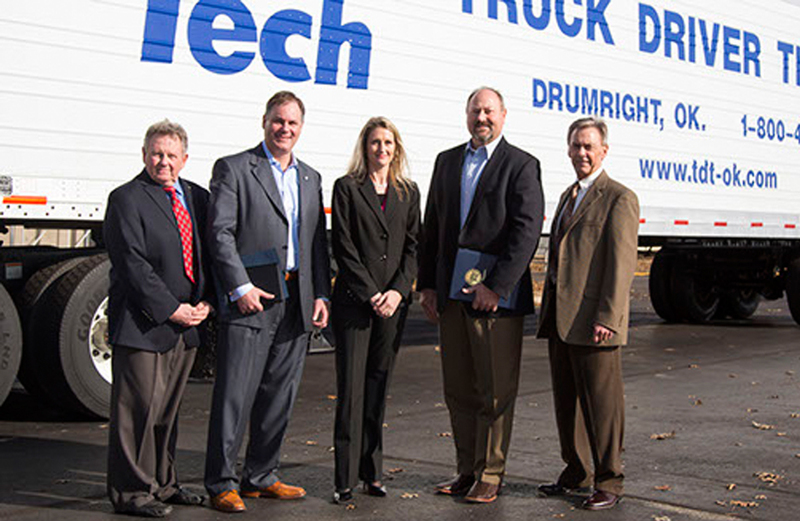 (L-R) Central Tech Truck Driver Training Director Marc Brown, Representative James Leewright (R-29), CareerTech Interim State Director Marcie Mack, Representative Kevin Wallace (R-32), and Central Tech Superintendent Phil Waul. Central Tech hosted newly elected legislators, Representatives Leewrite and Wallace, for a day on the Central Tech campus, showing them how CareerTech and Central Tech work with advisors and local industry to ensure that students learn the skills needed to be valued members of the workforce.